Rodney Dangerfield on the set of "Easy Money"
NEW YORK -- Hey, folks! Folks! There's a guy up here tellin' jokes! 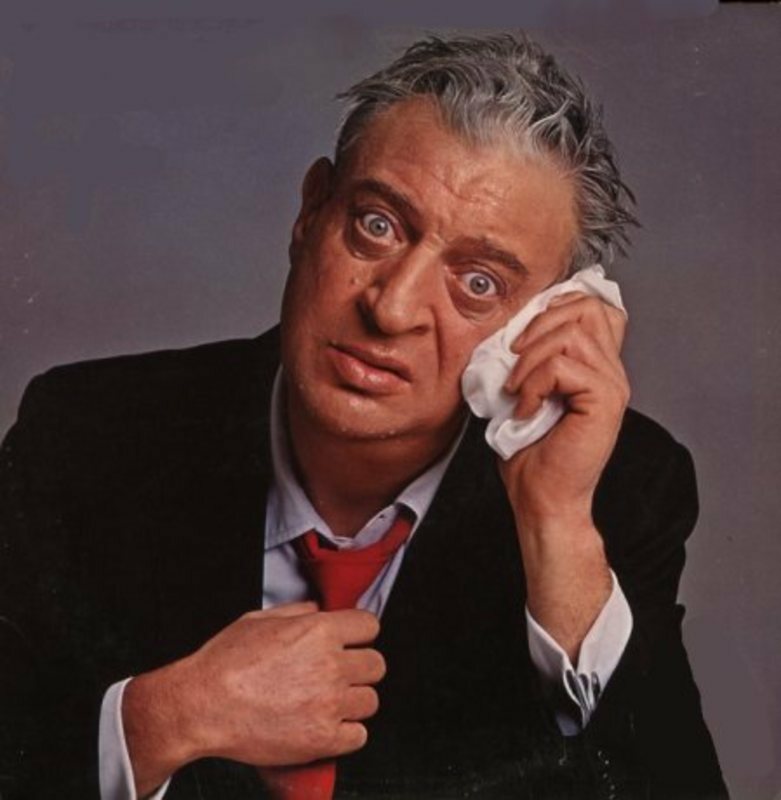 I will not soon forget my first sight of Rodney Dangerfield. He was standing on a table in his undershorts, shouting, "Don't worry! They sewed them shut!" Seat was pouring off his face and neck. As fast as an assistant could throw him towels, he was moopping his brow. His hair was the color of old dishwater, his knees knocked, his eyes bulged out of his face, his hands and his elbows shook in different rhythms. And he was wearing black wing-tip dress shoes and socks held up with a garter belt. "All right now, everybody, quiet down, please," said Jim Signorelli, who was directing Dangerfield's new movie. "Are you ready, Rodney?" "Ready? I'm dyin' up here. This is the weirdest thing I ever heard of. I'm about to start bein' funny and so you tell everybody to shut up. No laughs, everybody -- he's being funny now! I'll tell you what it is. It's a comic's nightmare, that's what it is!" Dangerfield, standing on the table top in his underwear and wing tips, began to vibrate. His elbows knocked against his rib cage, his hands were palsied, his neck jerked back and forth. A platoon of three tailors descended on him, measuring everything at once: His arms, legs, biceps, hat size, wrists, ankles and other parts not often measured by even the most meticulous tailors. "Cut! Print! said Signorelli. Dangerfield's vibration slowed somewhat. "Mr. Dangerfield?" a photographer said. "Could you turn this way, please?" "Hey, take it easy, honey, will ya? I ain't got no good side!" This was in the old Astoria movie studio up in Harlem, where movies were made in the early days and are now being made again. The name of the movie is "Easy Money" (1983), and it will star Rodney Dangerfield in a screenplay by Dangerfield and others, including National Lampoon's P.J. O'Rourke. Dangerfield plays a Rodneyesque character in the movie, an Italian-American family man who is given a chance to inherit the family firm if only he will only swear off drinking, smoking, gambling and all other vices for one year. Dangerfield will be 60 this year. He is at the top of his game. He recently made his 68th appearance on the "Tonight" show. His last album, "No Respect," won a Grammy. His cameo appearance in the 1980 movie "Caddyshack" was credited in the industry with helping to boost that movie's record at the box office. He runs Dangerfield's nightclub in New York and appears there occasionally. He is booked solid on the road, and will appear in Chicago Saturday night at the Auditorium Theater. It was necessary to schedule two performances, at 7 and 10 p.m. (the first show has been sold out). "Easy Money," the first movie top-lining Dangerfield, will be released this summer. He has another album in the works. Somewhere in the distant past of this strange and complicated man, there is even a real name. I was thinking that the nephew from Miami would probaby be in a position to supply me with it, but I never got a chance to ask him. "Now they want me to make another movie," Dangerfield was saying. "They want me to do a remake of 'My Little Chickadee,' with W. C. Fields and Mae West." "This guy?" said Rodney. "He's an Italian from Staten Island. That's a borough of Manhattan. I know you got Italians in Chicago. Maybe not from Staten Island. I know this guy that I play because I grew up with guys like this guy. In a way he's like me. In another way, he'a a character. No matter who I play, in some ways I'm playing myself, only a little off, you know? This guy is a nicer guy than the guy in 'Caddyshack.' He's a wise-cracking guy, only more humble." "Because I never grew up," said Dangerfield. "And, plus, its' a combination of things." He counted them off on his fingers. "One, I don't get no respect. Everyone thinks they're a loser in life, particularly some kid in college. Two, I got a young head, because I never grew up, or else I wouldn't be in this business, killin' myself. Third, I work quite hard at making everything I do funny. When I go on Carson, I always got all new stuff. Number four, which is, maybe I'm funny."